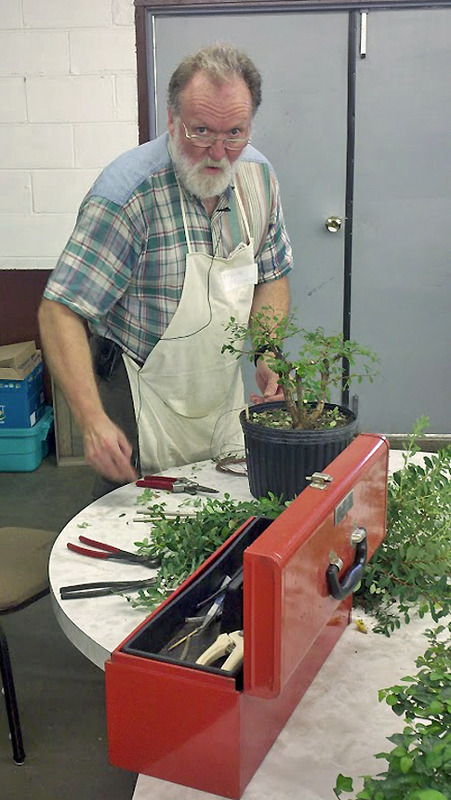 I got myself into it: the Master Gardeners have a booth every year at the Kosciusko Community Fair, and I asked if they would like a bonsai presentation this time. They accepted, and I was committed! The spot I was given was built for cooking demonstrations. 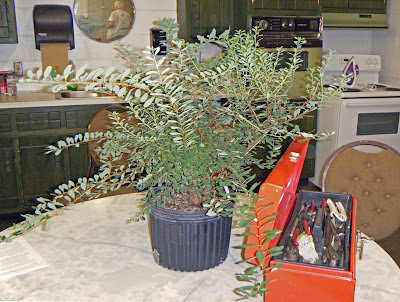 That was good, because it meant plenty of waterproof counter space, where I could work and display a few trees. Chairs were set up for 12-14 people, and others passing by had space to stop if they wished. Except for the fact that it wasn't the best setting for taking pictures, I could hardly have asked for a better setup! Wiring almost finished, as two of the more interested observe. Photo by Paul E. Heimbach. 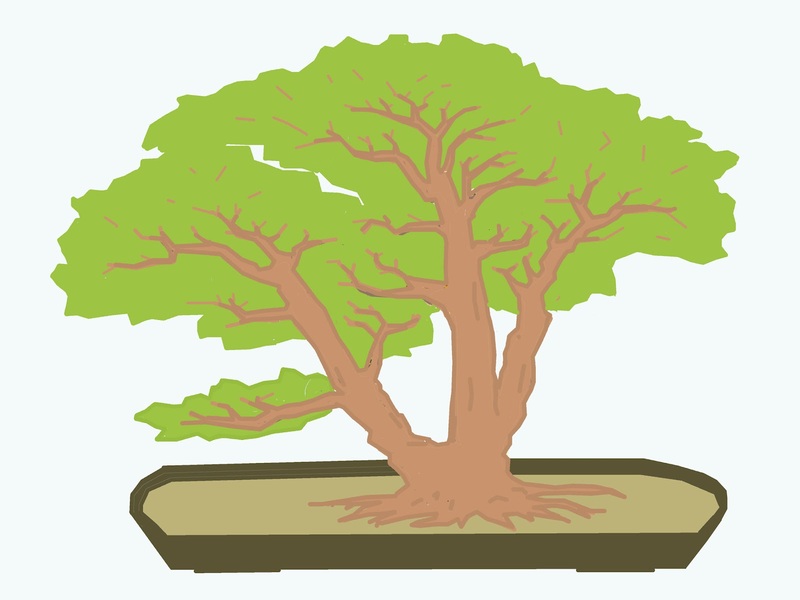 My preliminary talk focused primarily on what a bonsai is and what it is not. 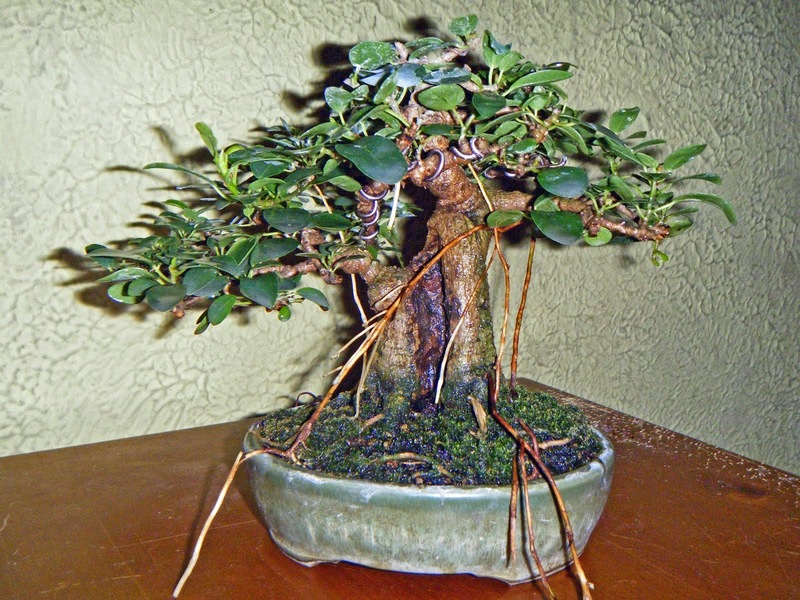 (For example, a bonsai is a living image of a tree; it is not grotesque for the sake of being grotesque.) 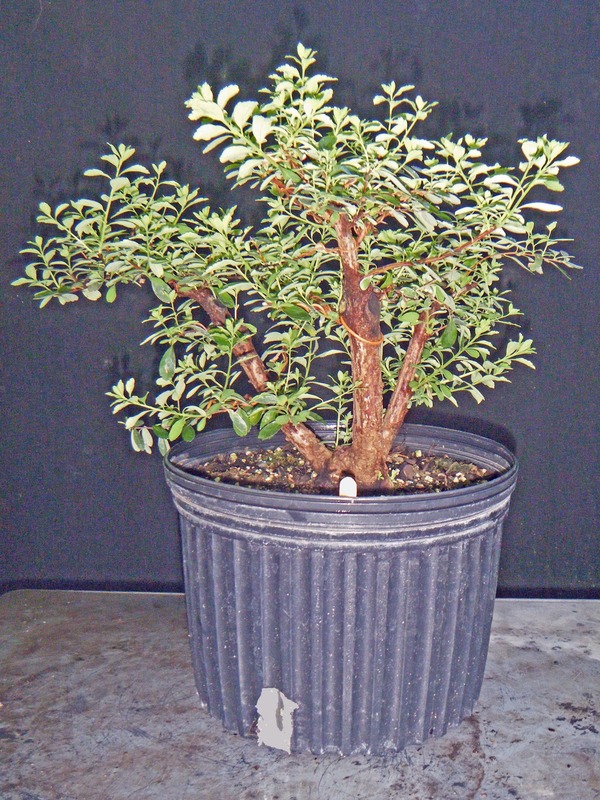 The main program was the creation styling of a spiraea, Spiraea japonica 'Snowmound.' I bought the shrub in late 2010, and had done some preliminary work - including, I told my audience, hours spent studying the tree and deciding on a good design for it. I also let it grow out this season, to bulk it up as much as possible. That, of course, also increased the visual drama of "before" and "after!" The response was encouraging. Some people came at the beginning and then moved on; some passersby noticed and stopped to watch for a while. Half a dozen of my original audience stayed for almost the entire time, and one man ( a member of this site) did stay from beginning to end. He also asked some of the best questions. Not that he was the only one asking: there were a number of good, perceptive questions. Maybe the very best thing about them was that they weren't all from the same person. But a friend, Paul Heimbach, snapped a couple of pictures with his iPhone, and has been kind enough to let me use them. His picture of the styling in progress (above) is the only one available. The other one - to the right - is a little problematic: I put on a mock scowl when Paul aimed his iPhone, and he caught me! Understand that I'm not really about to throw the tree at him! Thanks for the pictures, Paul. I took four trees in bonsai pots (three of my own, one of my daughter's,) for display. 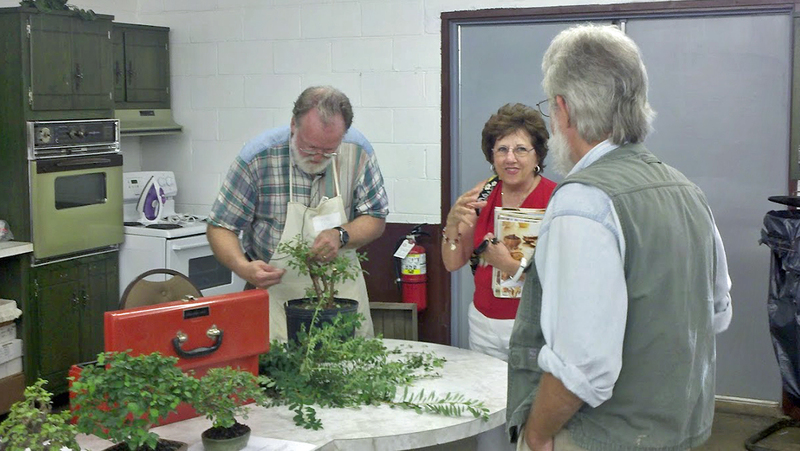 I also took two in-training trees, a yew and a Ficus microcarpa 'Tigerbark," so people could see different stages of development. 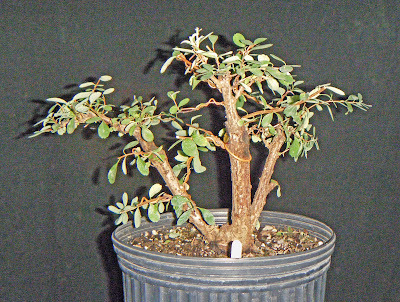 My willow-leaf fig seemed to be the one that people liked the best, tho all the trees got positive comments, I think. Children were impressed to know that the owner of the elephant bush was 11 years old. 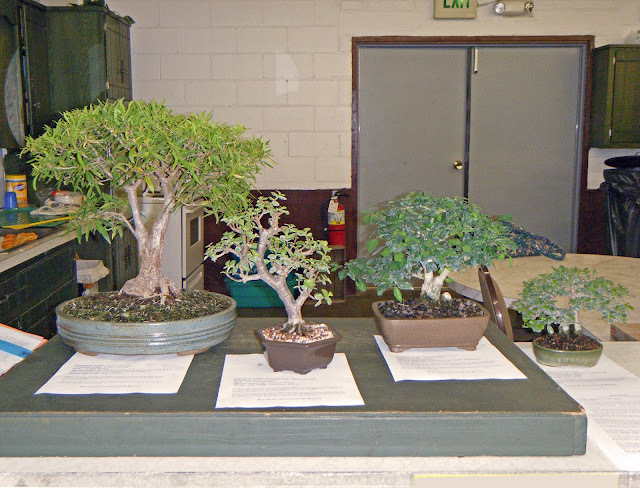 Display trees, with information sheets. Left to right: willow-leaf fig, elephant bush, parrot's beak, veldt fig. The most encouraging part of the evening had nothing to do directly with bonsai. I have had a speech impediment all my life. Twenty years ago, it was as bad as the prince's stutter in the movie "The King's Speech." (I'm not exaggerating.) In recent years it has greatly improved, tho I'm not sure why; but when I'm under stress -- such as when I get myself into a solo public demonstration! -- it can still give me difficulty. I had prayed a great deal about that going into the demonstration, and I wore my "Speacheasy" device. And my fluency thruout was almost perfect! My prayers afterward, as you will surmise, were prayers of thanksgiving! 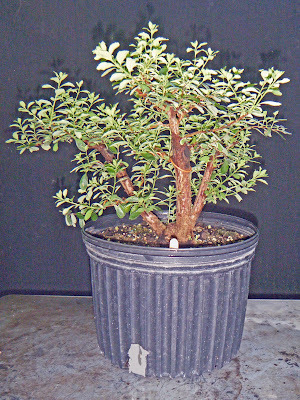 Here's a picture of the spiraea taken today; and a virt of the sort of eventual image I see in it. After 2-1/2 weeks of recovery. What it might look like in 5-10 years. They want me back next year, which is another encouragement. 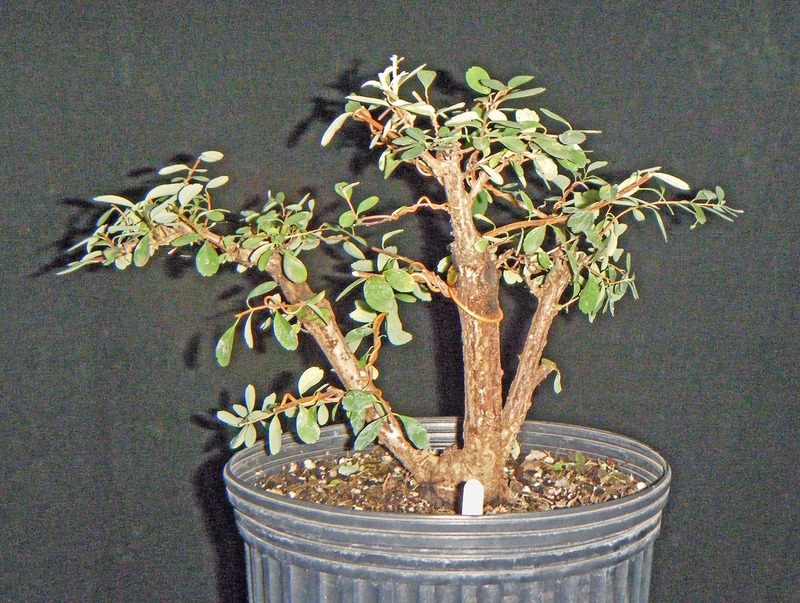 ☺ I'm already mulling over what I might talk about (probably tropicals,) and which of my trees will be ready for its first major styling! Great post Steve. Well done, not an easy thing to do for the first time. Thanks, Ian, for your kind words. I'm sure you speak from experience!